An official website of NYC government. How might we replace all gas-powered vehicles in NYC? The City of New York is seeking to test breakthrough technologies for charging electric vehicles. Track 1: Emerging technologies for fast charging and smart charging electric vehicles (EVs). For example: self-charging streets, inductive/wireless charging, 350+ kW charging, solar carports, connected vehicle solutions, vehicle-to-grid technologies, and new charging technologies using existing street, garage, and building infrastructure. Track 2: Immediately commercializable EV charging technologies. For example: 25-150 kW charging and solar parking canopies with integrated EV charging. How will we charge vehicles in 5-10 years? How will the built environment change to incorporate new infrastructure? How might EVs provide adaptive support that improves management of the electric grid? For Track 1, challenge participants will propose technologies with the potential to disrupt the global EV paradigm. Finalists will have the opportunity to demonstrate their technology in NYC to government representatives, including the Chief Fleet Officer of New York City. For Track 2, challenge participants will propose a mix of charging technologies and an adoption plan to maximize the portion of vehicle miles powered by electricity. Proposed technologies and business plans should include site identification (either specific sites or a methodology), target market, and site layout. Challenge participants should build upon the current state of EV charging infrastructure in New York City, including the plan to develop an EV fast charging hub in every borough in 2018. Challenge participants are encouraged to pursue real estate and business partnerships to enhance utilization and future connected/autonomous mobility options, including car share and freight fleets. City-led climate action to reduce our contributions to climate change has never been more important or more urgent. Despite federal abdication of climate leadership and withdrawal from the global Paris Agreement earlier in 2017, Mayor de Blasio pledged New York City would adhere to the agreement and accelerate the City’s already ambitious goal of reducing greenhouse gas emissions 80 percent by 2050. Reaching New York City’s local targets in support of addressing this global challenge will require cleaner building, transportation, generation and transmission technologies, packaged with creative urban design solutions. Transportation alone makes up 30 percent of NYC’s greenhouse gas emissions, and 90 percent of that sector is contributed by private vehicles. If we can help these drivers make the switch to EVs easier as the price of those cars comes down, we can make a big impact on reducing the City’s greenhouse gas emissions, and in turn create a better quality of life for all New Yorkers. EV infrastructure has the potential to reshape the urban built environment and provide dramatic impact in helping NYC reduce its greenhouse gas emissions. Unfortunately, access to public charging station infrastructure is one of the main barriers to wider adoption of EVs. To spur development of this infrastructure, the City has invested $10 million to ensure there are fast EV chargers in every borough beginning in 2018, with the goal of catalyzing 50 fast charging sites citywide by 2020. The technology exists to execute this vision — if we can apply out-of-the box ideas as smartly as possible. Scaling up to 50 fast charging locations citywide by 2020 will require business innovation to generate a self-sustaining model for installing, owning, operating, and maintaining fast charging infrastructure. Looking beyond current technologies, EV infrastructure has the potential to reshape the urban built environment. NYCx is the world's first municipal program to transform urban spaces into hubs for tech collaboration, research, testing and development. New York City’s diverse population, economy, and landscape offer a unique opportunity for technology makers, futurists, and startups to develop technologies and breakthroughs that are sustainable, fair, and improve how we live in the world. NYCx is housed in the Mayor’s Office of the Chief Technology Officer (MOCTO). The Mayor's Office of Sustainability executes responsibilities mandated by Section 20 of NYC Charter, including overall citywide sustainability policy development, oversight, and implementation in coordination with relevant City agencies. MOS’s sustainability goals are outlined in New York City’s Roadmap to 80x50 and 1.5°C: Aligning New York City with the Paris Climate Agreement. The Department of Citywide Administrative Services (DCAS) operates a fleet of 30,000 city-owned and leased vehicles, the largest municipal fleet in the United States. Through Mayor de Blasio’s NYC Clean Fleet initiative, DCAS is working to cut greenhouse gas emissions in half by 2025. As part of this effort, NYC currently operates over 1,000 on-road electric vehicles with plans to for expansion in FY18 and beyond. This is one of the largest EV fleets in the world. The City also operates 630 off-road electric and solar units including carts, forklifts, and sign-boards. The City now operates over 422 EV chargers for fleet units including our first solar carport units. The City is working to expand its Battery Electric Vehicle (BEV) fleet and fast EV charging ports, including solar carports. As part of this effort, new and emerging technologies will be considered to help achieve the Clean Fleet Initiative. 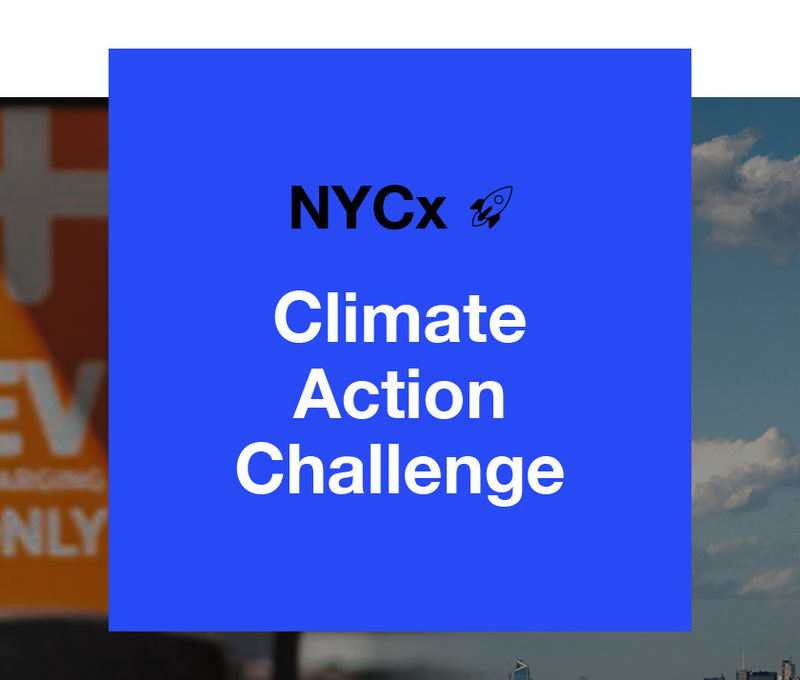 Up to six finalists from Track 1 and Track 2 will be awarded $13,000 apiece to demonstrate their technology in NYC to government representatives, including the Chief Fleet Officer of New York City, NYC Department of Transportation, Mayor’s Office of Sustainability, and others. In some cases a finalist may present a live demo bringing their proposal or technology to life (e.g. virtual reality demo, charging demo, city-scale mock-up with adoption scenarios). The winner may have elements of their submission included in the City’s EV charging roadmap (currently in development). Applicants submit short statements expressing the team’s concept for the challenge and supporting documentation. Qualified expressions of interest will be invited to submit a full application, including proposed technologies, business model, adoption, site selection, site layout, and business and property partner statement of support. Up to three finalists from each track will be able to present their proposals and/or technology in NYC. The winner will be announced in May 2018. City of New York. 2015 All Rights Reserved, NYC is a trademark and service mark of the City of New York.